Emerging from the ground at sunset, the Lucie lamp offers all the comfort of night lighting and a bare ground during the day. This original and innovative idea, patented since May 2016, came to the mind of Mr. Eric Lechat to respond to the need to easily mow lawn parks and gardens. Currently, the product is available for sale. A website dedicated to the lamp www.lampelucie.tech allows to see a detailed presentation. Customers can choose the height and color of hat suitable for their decoration. 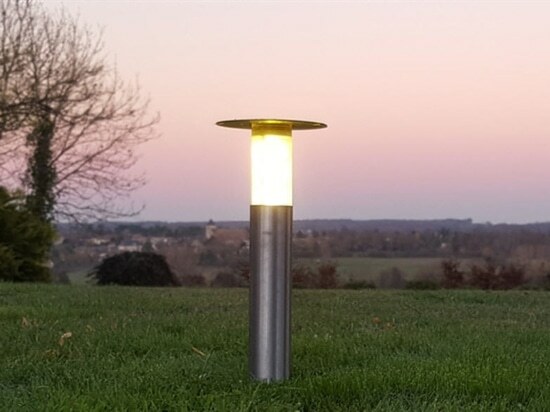 Other models of lamps are being studied: directional spotlight, plant lighting, color change as well as a solar charging panel will complement the range. A product "Made in France"
Each unit is manufactured by ELTECH Equipements with the participation of local French subcontractors. The company is looking for new partners for the sale, distribution and / or installation of its lamps in France and abroad. Located in the Paris region, ELTECH Equipements is a design office that proposes the design and realization of special machines that can be autonomous or integrated on production lines. From design to realization, technical expertise and experience of more than 25 years allow this company to work in different fields of industrial engineering such as electricity, mechanics, automation and robotics.